I love drinking a good Sangria cocktail from time to time but I don't like all of the fattening calories that come along with it. Well, today I am sharing a great low-calorie Sangria recipe with all of you from Voga Italia. 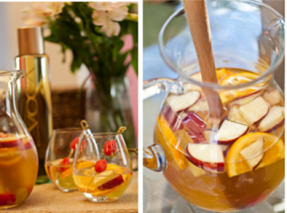 Pour VOGA Moscato and brandy in a large pitcher and add sliced peach, apricot, apple, orange, and raspberries. Chill mixture for at least one hour (the longer the better!) and stir before serving. Disclosure/Disclaimer: The recipe and photo was provided to us from Voga Italia. You must be 21 years of age or older to consume alcohol. Please drink responsibly.